RRB Secunderabad declared its NTPC stage 1 results 2016.RRB Secunderabad releases 1st stage Exam (CBT) for NTPC (Graduate) posts against CEN No. 03/2015 and Cut off marks. 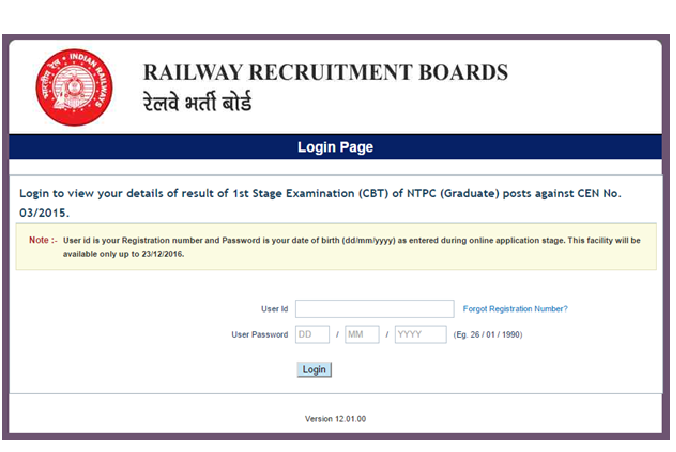 To know results open login page (like below). Enter User Id and User Password (Date of Birth). it shows two tabs one for result and another for cutoff details as classification wise.